A file with the RAF file extension is a Fuji Raw Image file. This format stores an unprocessed image taken from a Fuji digital camera. A JPG of the same image captured by the camera may be included in a RAF file. The RAF file extension is also used for Riot Archive files with the League of Legends video game, and are seen alongside RAF.DAT files. The DAT file stores the actual data but the RAF file describes where to unpack the contents. Fuji Raw Image files can be opened with Able RAWer, Adobe Photoshop, XnView, and probably some other popular photo and graphics tools as well. The free RAF Viewer can open and resize RAF files too. RAF files that are used with Riot Games video games can be opened using Total Commander, as long as you also install the RAF Packer plugin. Other file formats have file extensions that look awfully similar to .RAF but that doesn't mean they can open with the same programs. Some examples include RAR, RAM (Real Audio Metadata), and RAS (Remedy Archive System). 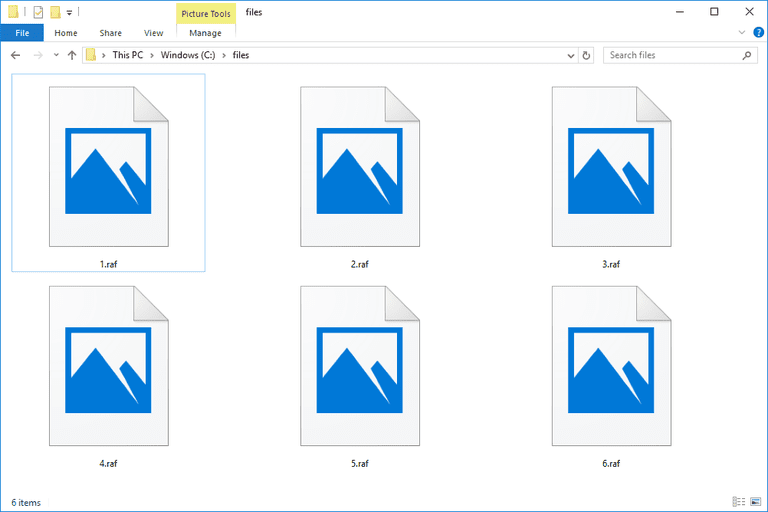 If you find that an application on your PC does try to open the RAF file but it's the wrong application or if you would rather have another installed program open RAF files, learn how to change the default program for a specific file extension in Windows. The RAF Viewer program mentioned above can convert RAF image files to JPG, GIF, TIFF, BMP, and PNG. You might also be able to convert a RAF file if you open it in Photoshop or Able RAWer and then save it under a new format. Adobe DNG Converter is a free file converter for Windows and macOS that can save a RAF file (from some Fuji cameras) to the DNG format. Zamzar is another RAF file converter that can save the file a number of different image formats. Since Zamar is a website, you don't have to download the converter to use it, so it works equally well on all operating systems. There's most likely no need to convert a Riot Archive file to any other archive format.